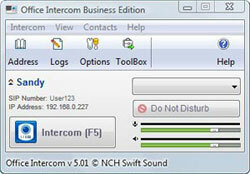 Office Intercom Audio Communication Software lets you use your computer to speak to others over the internet or your local office computer network. It works as a virtual intercom and feels a little like using a CB radio. To talk to anyone else who has installed OfficeIntercom anywhere in the world, just hold down a key on the keyboard. Speak into your computer's microphone and you will be heard through the other computer's speakers. *Encrypt your voice with private key strong encryption. *Use your network or a VoIP SIP service provider. *Can be used with a headset, a microphone and speakers , or the Express USB phone device. *Can be configured to work behind NATs and Firewalls using UPnP or STUN methods. *Supports echo cancellation and noise reduction when using a microphone and speakers. *Store and access thousands of contact phone numbers in the Office Intercom Address Book or using the Windows Address Book or Contacts. *"Do Not Disturb" option stops others from taling to you when you are busy with other matters. Qweas is providing links to Office Intercom Audio Communication Software 5.10 as a courtesy, and makes no representations regarding Office Intercom Audio Communication Software or any other applications or any information related thereto. Any questions, complaints or claims regarding this application Office Intercom Audio Communication Software 5.10 must be directed to the appropriate software vendor. You may click the publisher link of Office Intercom Audio Communication Software on the top of this page to get more details about the vendor.